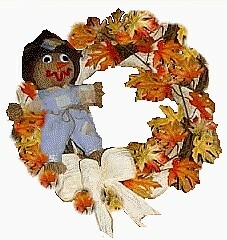 You can add our cute yarn doll scarecrow to this wreath, or another scarecrow doll, or your choice of optional fall decorations. 2. Wrap the paper twist around the wreath, but leave some of the grapevine wreath showing. Glue in place, fastening the ends of the paper twist together. 3. Beginning at the glued join of the paper twist, lay down the two stems of silk fall leaves. Experiment a little, to position the leaves around the grapevine wreath in the way that you find most attractive. Use a few drops of glue under the leaves to fasten in place. 4. Cover the two ends of the paper twist and the end of the stems with a big two loop paper twist bow and tails, as shown in our photo. 5. Optional: If you are adding the our yarn doll scarecrow, add it to the left side, fastening in place with glue or wire pulled through to the back of the wreath. Now you have a new home for Mr. Scarecrow and a great seasonal wreath to decorate your door for the fall. Enjoy!